Joan Mitchell, Ode to Joy (A Poem by Frank O’Hara), 1970-1971. Oil on canvas, 100 1⁄2 x 197 1⁄4 in (280.67 x 501.02 cm). Collection University at Buffalo Art Galleries, © Estate of Joan Mitchell. Poetry was a lifelong source of inspiration and collaboration for Joan Mitchell. To celebrate April's designation as National Poetry Month, we compiled a selection of Mitchell’s artworks that were inspired by poems and poets. Smoke, 1989, folio 9 of 19. Etchings by Joan Mitchell with poems by Charles (Hank) Hine. Color sugarlift and spitbite aquatint, 14 3/16 x 18 1/8 in. (36 x 46 cm). Collection Cantor Arts Center at Stanford University, Gift of the Charles Henri Hine Family. © Charles Hine and © Estate of Joan Mitchell. First up is a spread from the artist's book Smoke, a collaboration between Mitchell and the poet Charles (Hank) Hine. Printed and published in 1989 by Limestone Press in San Francisco, this unbound portfolio contains sixteen aquatint etchings by Mitchell alongside poems by Hine, including the folio depicted here. The text reads: "We are in the world as smoke / is in the world / drawn to its contours / fitted and pressed. / What we are surrounded by / we give ourselves to that." Joan Mitchell, A Few Days I (After James Schuyler), 1985. Oil on canvas, 86 5/8 x 78 ¾ in (220 x 200 cm). Private collection, © Estate of Joan Mitchell. Joan Mitchell, A Few Days II (After James Schuyler), 1985. Oil on canvas, 86 5/8 x 78 ¾ in (220 x 200 cm). Private collection, © Estate of Joan Mitchell. Above are two paintings that Mitchell titled after a poem by James Schuyler. A Pulitzer Prize-winner and a member of the New York School, Schuyler was also a friend to Mitchell. She owned a well-worn copy of his poetry collection A Few Days and titled these paintings after the eponymous poem in 1985. Poems, 1992, folio 8 of 8. Lithographs by Joan Mitchell with poems by Nathan Kernan. Color lithographs, 21 ¼ x 15 ¾ in. (54 x 40 cm). © Nathan Kernan and © Estate of Joan Mitchell. Shown above is a page from the artist book Poems, a collaboration between Mitchell and the poet Nathan Kernan. Printed and published in 1992 by Tyler Graphics, Ltd. in Mt. Kisco, New York, this unbound portfolio contains six color lithographs alongside poems by Kernan, including the folio depicted here. 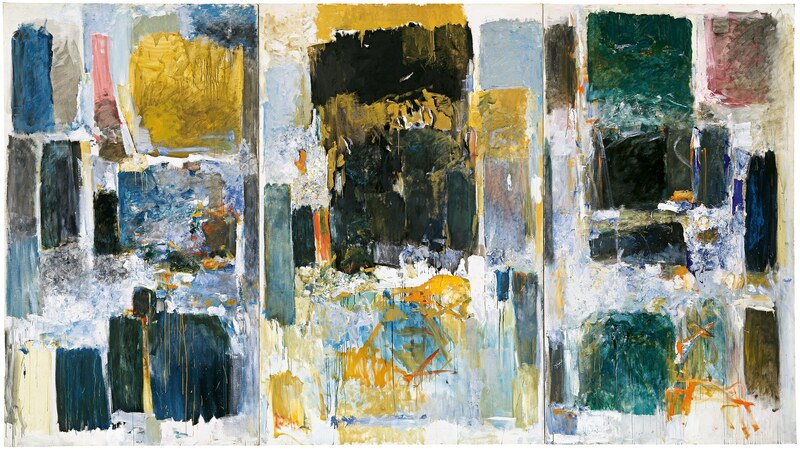 And last, but not least: Joan Mitchell’s painting Ode to Joy (A Poem by Frank O’Hara). A poet, curator, art critic, and leading member of the New York school, O’Hara was also a close friend to Mitchell. In an homage to O’Hara and his poetry, Mitchell’s painting borrows its title from his poem of the same name, which begins: “We shall have everything we want and there’ll be no more dying / on the pretty plains or in the supper clubs / for our symbol we’ll acknowledge vulgar materialistic laughter / over an insatiable sexual appetite / and the streets will be filled with racing forms / ..."